It might seem like GPS coordinates can be added to a contact on the iPhone. When tapping a pin in Apple’s app Maps iOS provides the options Create New Contact and Add to Existing Contact. The reality is that Contacts only supports storing addresses, not GPS coordinates. The location that’s actually stored in the Contacts app will not be accurate unless the GPS coordinates can be associated with an address. 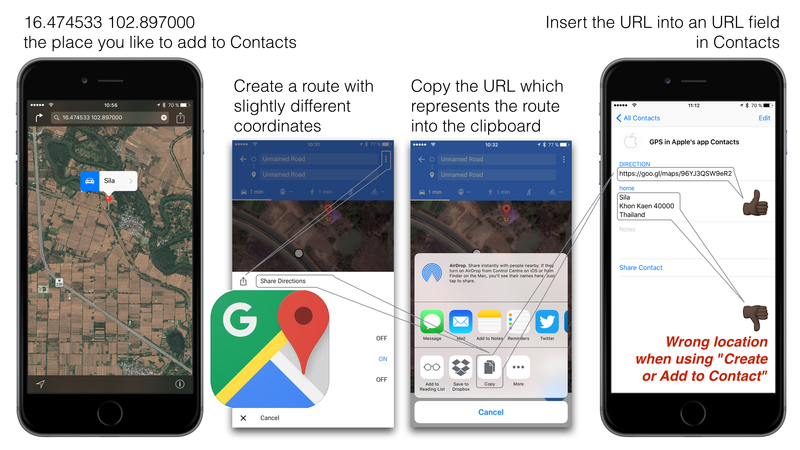 This means that if the location is in a rural area or somewhere that doesn’t have an address that the Contacts app can identify, it will point to a different place. This can be miles away from your original pin location. In my humble opinion it cannot be called a feature but a BUG. So the address can only be used for postal purposes but in many cases not for localization. But there is a solution using Google Maps. Just follow these 3 steps. as the endpoint of a route. choose SHARE DIRECTIONS and then COPY. to the clipboard that you can insert in an URL field of Apple’s app Contacts. Now you just have to tap on the URL in the contact to show a place’s exact location in Google Maps.